In a move that does not at all make it seem like Google is jealous of Apple and its recent extremely expensive music-related purchase, the tech company has just bought Songza, a popular music streaming service that, unfortunately, has nothing to do with pizza. As reported by Deadline, Google doesn’t intend to change anything about Songza for now, but it is planning to “bring what you love about Songza to Google Play Music,” presumably by just taking its existing music system and gluing Songza on top of it. Also, it’s important to point out that when we referred to Songza as a “popular music streaming service,” we meant that relatively. Deadline points out that it has about 5.5 million subscribers, which makes it a lot more popular than The Dawes House—The A.V. Club’s own music streaming service that we just made up—but significantly less popular than Pandora’s 70 million and Spotify’s 40 million. The big gimmick for Songza, which sets it apart from Pandora and Spotify, is that its playlists are compiled by a team of experts who, hopefully, know more about music than you do. You tell it you want “workout songs” or whatever, and it plays stuff that its experts have determined to be suitably upbeat and empowering. The Dawes House, meanwhile, would play a low-key indie rock cover of C&C Music Factory’s “Gonna Make You Sweat” on a never-ending loop. 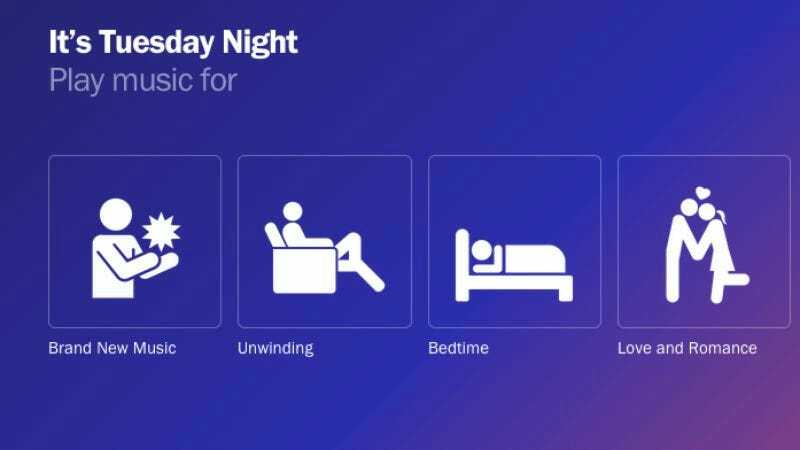 Though it holds a smaller base of subscribers than its competitors, Songza’s idea of telling people what to like must seem especially appealing to Google. It will be a great tool for taking over the world.